Will we see any movement from this meeting? I'm willing to bet that we'll see no discernible change. Any takers? Chicago, IL (AOB) - The Assembly of Canonical Orthodox Bishops of the United States of America convened its sixth annual meeting Tuesday, September 15 in Chicago, IL with 45 hierarchs in attendance. The day began with a celebration of the Divine Liturgy at St John the Baptist Orthodox Church in Des Plaines, IL. Archbishop Demetrios, Chairman of the Assembly, opened the meeting. His remarks can be read in their entirety here (PDF). It's worth reading if you're interested in Oriental Orthodox-Eastern Orthodox relations and some mention of the restructuring plans under discussion. General business followed, including acceptance of the minutes from Assembly V available here (PDF), a financial report from the Assembly’s treasurer, Metropolitan Antony, and brief reports from the Secretary of the Assembly, Bishop Basil, and the Chairman of the Committees, Bishop Maxim. Metropolitan Antony reported that a budget shortfall is expected and expressed his hope that the hierarchs would seek donations from the faithful to meet the shortfall. 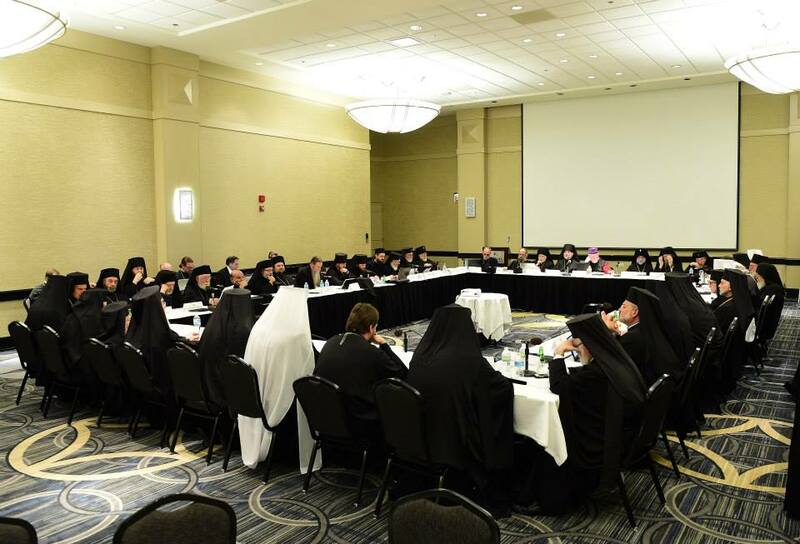 Bishop Maxim called attention to the committees that have been particularly active to-date: Agencies and Endorsed Organizations, Canonical Regional Planning, Ecumenical Relations, Financial Affairs, Legal Affairs, Pastoral Practice, Monastic Communities, and Youth. The hierarchs then devoted several hours to canonical regional planning, the first of two such planned sessions. Each of the first hierarchs of the Assembly’s 12 jurisdictions expressed his opinion of a proposal that had been circulated in advance by the Committee for Canonical Regional Planning. The proposal by the Committee for Canonical Regional Planning focuses on three main areas of common work over the next three years: diverging pastoral practices among the jurisdictions; development of possible models for a canonical reorganized Church administration; and greater cooperation and integration of jurisdictional ministries and departments. The hierarchs were allotted approximately 15 minutes each to express their views on the proposal. Metropolitan Joseph of the Antiochian Archdiocese was not present; his statement was read on his behalf. Discussion on the opinions expressed will ensue in the opening session on Wednesday. In the evening, the hierarchs joined more than 100 Chicago-area youth at Holy Resurrection Orthodox Cathedral for a service of thanksgiving and a question and answer forum with the bishops. Considering the size of Orthodoxy in the Chicago area, that's a woefully insignificant number. I'm a bit ashamed of the effort here. Four hierarchs—Bishop Gregory (ACROD), Bishop Anthony (AOCA), Bishop Maxim (Serbia), and Archbishop Michael (OCA)—sat on a panel and answered questions from the youth. Questions touched on a wide range of topics, including what parishes can do to keep youth in the Church, anxiety and suffering, the possibility of Church unity, and the Church’s view of homosexuality. The event was videotaped and will be made available on the Assembly’s website in the near future. The Assembly wishes to express its sincere gratitude to the clergy and faithful of St John the Baptist and Holy Resurrection for their gracious hospitality in hosting the hierarchs. I'm hoping the work of our subcommittee of the Pastoral Practice Committee will be discussed, and the miscarriage/stillbirth booklet approved, but I'm trying not to get my hopes up too far.